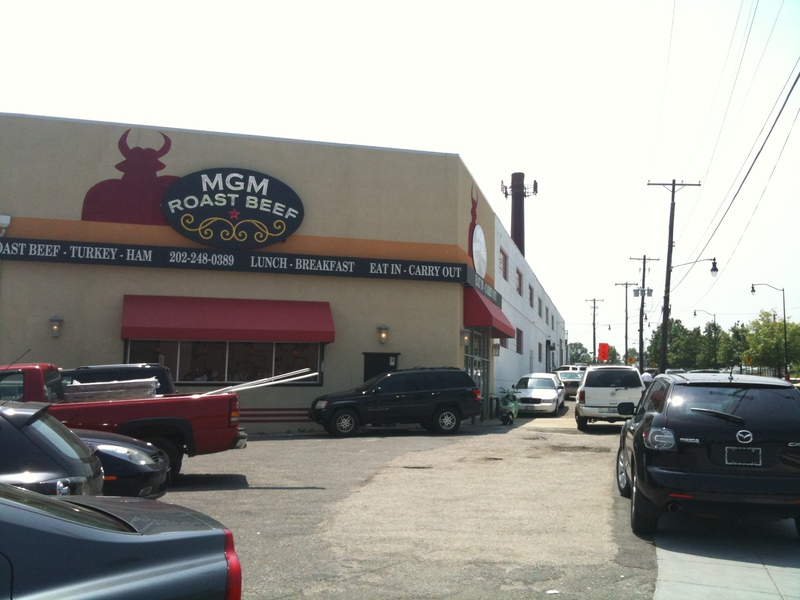 I had the opportunity to eat lunch at MGM Roast Beef today. Although this is not directly on RIA, it is just off of the Avenue, next to the auto auction and on the other side of the Giant/Home Depot shopping center. 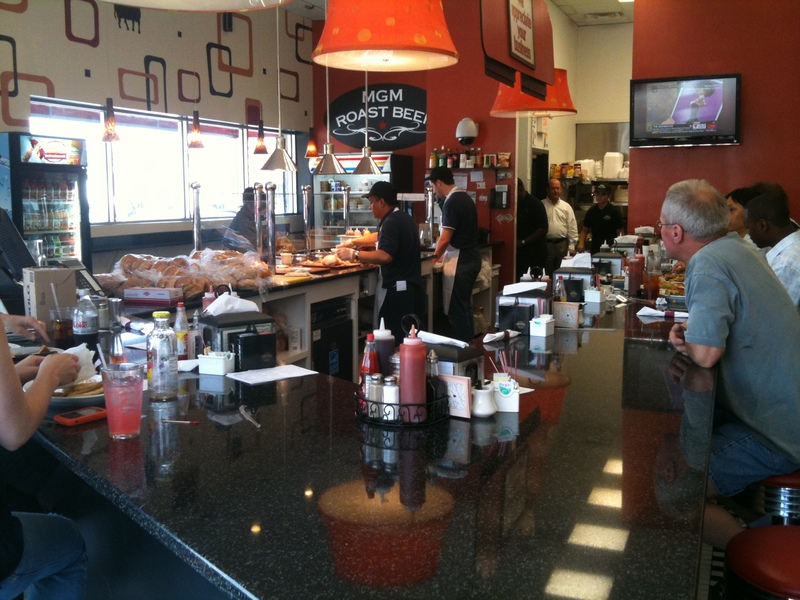 In fact, the eatery is owned by Mark Loesberg, President of the Capital Auto and Truck Auction, Inc. The building it is in use to be a liquor store and when the lease came up for renewal a little over a year and a half ago, Mr. Loesberg decided not to renew the liquor license and instead, open his family owned sandwich shop. The menu at the location includes breakfast, lunch, and dinner (although it closes at 6:00pm M-F and 3pm on Saturday). It has a counter you can cozy up to, grab the quick order form for a sandwich, mark what you want on your sandwich, and the waiter picks it up. You can order off of the menu but you have to let the waiter know (not a big deal). There is no alcohol in the place which is fine. It doesn’t seem like the kind of place that needs it. They have some great roast beef, ham, turkey, brisket, etc sandwiches and fries. They also offer a variety of other foods (breakfast sounds yummy). Click here to check out their website! I strongly urge residents to frequent it! The fact that Mr. Loesberg decided to take a liquor store out of our area and replace it with a good eatery, we should applaud and frequent the place to ensure that it sticks around. But don’t take my word that it is a great place to grab a sandwich or breakfast, Yelp! has rating of 4.5 out of 5 for the place, so you know that it is a good place! Oh, another reason I like this place: they deliver. If you are wondering why they close at 6pm on weekdays, 3pm on Saturday, and closed on Sunday, well, it is because the area directly around it is an industrial park (Post Office is across the street and BET is down the road a little). Maybe if we can get enough demand to this place, we can get them to stay open longer! Bfast here is really good. And everyone is very nice. The sandwiches are delicious and definitely worth the trip! I really enjoyed my rb sandwich. And the folks working there and eating there were all very nice. I’m going back for sure. One of my favorite places in the area, though I didn’t know it was owned by the same people who own the auto auction (possibly one of my least favorite businesses in the area, partially for obvious reasons and partially because they were supportive of the short-lived “special signs” legislation). Nice to know they deliver, though I really shouldn’t be getting delivery from a place only a few blocks away, the traffic and parking there is a HASSLE on the weekends. Also part of the reason why I thought they were competing, not cooperating, with the auto auction. A place closer to RIA that’s worth checking out is Chez Huareg Gourmet Bakery at 4th & RI. There website is http://www.chezharegpastries.com. You can even buy their cookies and cakes at Whole Foods!